PHUKET: Coral reefs at Phi Phi Island’s Maya Bay are already coming back to life since closing the area to tourists on June 1, says marine biologist Dr Thon Thamrongnawasawat. On March 28, the Chief of the Hat Nopparat- Mu Ko Phi Phi National Park Worapoj Lomlim confirmed to The Phuket News the closure of Maya Bay to any visitors during a four-month period this year from June 1 to September 30. Mr Worapoj told The Phuket News “After the most recent meeting of the marine national park consultation committee on Wednesday (Mar 28), it was agreed that Maya Bay will be closed to all visitor access during the monsoon period for four months. Following the March 28 announcement, on May 11 it was announced that boats taking tourists to visit Phi Phi Island’s renowned Maya Bay would no longer even be able to land or drop anchor at Loh Samah Bay, on the far side of the island, in the latest move to protect the island from environmental damage brought on by overtourism. Now, according to Mr Thon, deputy dean of the fisheries faculty at Kasetsart University, since the closure the coral reefs are coming back to life and he has even seen a baby shark in the area. “I am really impressed with the revival of the coral reefs in Hat Noppharat Thara-Mu Koh Phi Phi Marine National Park in Krabi province. I have even saw baby shark around this area looking for food. However, the coral reef still need some time to revive at Maya Bay. “Today we have taken corals to plants at Maya Bay. These coral pieces had been at Yoong Island but they were dislodged by underwater currents,” Dr Thon explained to The Phuket News today (Aug 30). 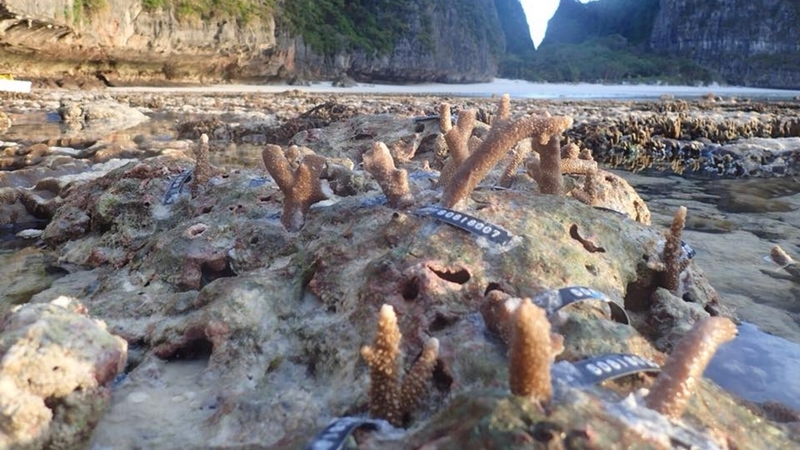 “We kept the corals alive at a floating platform beside Phi Phi Don and now they are better and alive. Today we joined them with the dead coral at Maya Bay,” he said. 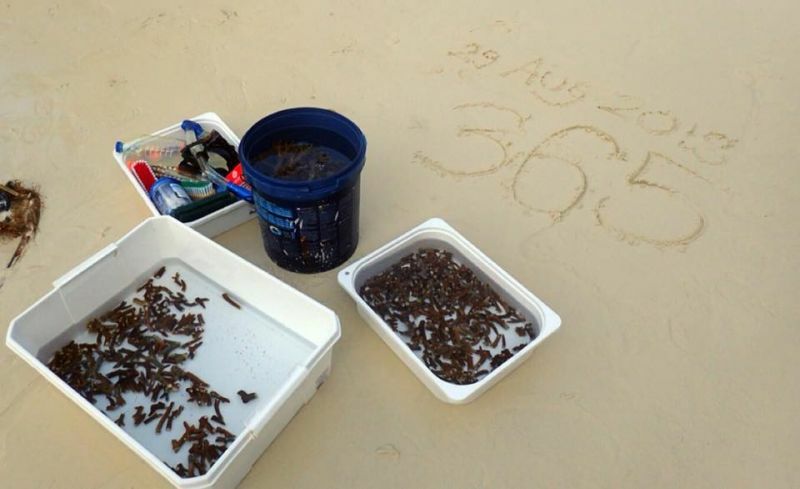 “We took 365 piece of coral to Maya Bay today and we have planted more than 2,000 pieces in the past but it can’t compare to new coral growing in future. “Everything we have done for the coral today is like an ‘apology’ for being late in protecting them. Also, we were too scared and negative to have thought of saving them,” he added. “We gave our promise that we won’t go back again. There will be no boats at Maya Bay again. All coral will be able to grow up in clear water. Then we will have paradise back. “Then it will show that Phi Phi Island is in the top five beautiful islands in the world. This is our promise,” Dr Thon concluded. The Phuket News notes that Mr Worapoj told The Phuket News on June 6 that whether or not boats will be allowed to start entering Maya Bay after Oct 1 remained to be seen. I am disappointed that Dr Thon not support the need for longer closure of the bay. Mr Worapoj, of course, is only considering financial options. We all know on forehand what that means in thai thinking. ...Money. What a load of crap, it is now the end of August, so this guy expects people to believe after 2 months the coral is magically growing back and wow he even saw a baby shark!! Pull the other one, this area has been raped by greedy Thai's for years, it will take more than this "quick fix" to revive it.